Play Me, I’m Yours (all weekend, throughout the Greater Cincinnati area): Start hitting those 35 pianos laid out across the area and remember to upload your pics and videos on the exhibit’s website for all to see! Great Inland Seafood Festival 2010 – in Newport all weekend. One thing about this heat, they won’t have to worry about melting the butter for ‘dem lobsters, eh? Check their website for all the delicious details! The Cincinnati Reds are in town taking on the Marlins all weekend (hopefully faring better than they did against the Cardinals this week). Friday’s game is 7:10 and there is a fireworks show afterwards. But our money is on Sunday. 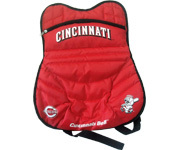 If you can brave the heat, Sunday’s 1:10 game is a winner – it’s a Meijer’s Family Day (one family member purchases a ticket at face value and then can buy the rest of the family’s tickets at HALF PRICE); it’s a Sunday Kid’s Giveaway day – the CUTEST catcher’s vest backpack (see pic, cute, eh?) goes to the first 10,000 kids 14 and under; and after the game, kids can RUN THE BASES! Yep, if you can survive the heat, this is an awesome day to see the Reds! If you are looking for a FAMILY atmosphere, seats in section 107 are a safe bet as this is the Meijer Family Section (alcohol free, with plenty of little ears and mindful mouths) – this section is included in the Meijer Family Day deal as well. 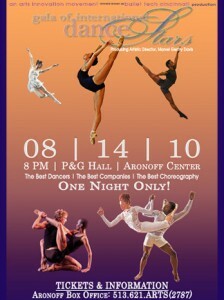 The Gala of International Dance Stars will inspire and amaze the dance lovers in your crew. Got your own aspiring ballerina? Surprise her with tickets to this one night only event at the Aronoff – Saturday at 8pm. 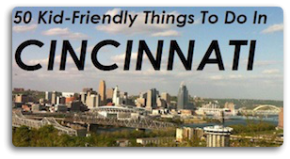 Pre-season games are a terrific opportunity to take your kids to see the Cincinnati Bengals without being forced to deplete their college funds. They take on the Broncos Sunday at 7pm at Paul Brown Stadium. You can get tickets as cheap as $17 if you go through Stub Hub (regular, one game tickets start at $65 I think). We got tickets through there for both pre-season games (P thought she was at the Super Bowl) and the seats were great with no hassle at all. Highly recommend it. Family ARTventures Tour – Take a docent-led interactive tour with fun facts and hands-on activities for the whole family. These tours take place at 1pm Saturday & 3pm Sunday, starting from the front lobby. MUD MANIA – at the Cummins Shelter in the Rentschler Forest Preserve Friday at 10am (event is free, but you will need a motor vehicle permit to enter). Summer Music Concert at Koenig Park in Reading: Friday at 7:00pm, featuring the Air Force Band of Flight. Bring your lawn chairs, snacks and beverages and enjoy an evening of great music under the trees and the stars. 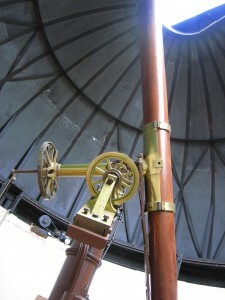 Speaking of stars, head to the Cincinnati Observatory for a night of stargazing…Astronomy Friday Public Program and Telescope Viewing: Friday 8:30 – 10:00. The program will go rain or shine, the viewing is weather permitting. Reservations required. Please call the Observatory @ 513.321.5186 for more information and for reservations. And if Friday doesn’t work for your schedule, you can venture out on Saturday to Stonelick State Park for a free public stargaze on the lake. Plenty of astronomy enthusiasts will be on hand, ready and willing to have you look through their telescopes and answer your questions. This is a great opportunity to check things out if your kids are interested in the world of astronomy. Begins at dusk. Or build a skyscraper to the stars at The Betts House on Saturday from 12 to 5. The cost for this drop in activity is only $2 and you can find more information by calling Betts House at 513.651.0734 or on their site. Clifford, the Big Red Dog is a favorite in our house. If your kids are fans as well, LM&M Railroad has just the thing for you this weekend. Clifford and Emily Elizabeth will be on hand to play, lead storytime and crafts for all their friends. Saturday and Sunday, trips head out at 10am; 12:15pm; 2:30pm and 4:45pm. Contact them at 513.933.8022 or visit their site for more details. Whole Foods Dog Event takes place Saturday 12-5 at their Rookwood location! 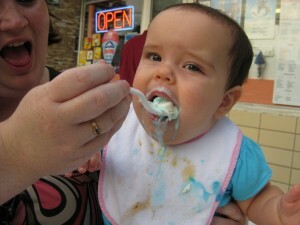 And both Deerfield and Rookwood locations will have their Saturday Kid’s Cooking Classes at 10am as well. Visit their sites for all the details. FAMILIES CREATE! The Taft Museum of Art will entertain everyone on Saturday 10am-12pm with a yummy building project – use pretzels, graham crackers and other treats to create your structure. Now that’s MY kind of architecture! And The Taft Museum of Art keeps the family fun going on Sunday 1-4 with FREE THIRD SUNDAY FUNDAY – Find dogs in art, hear a story about dogs in a museum, make a pop-up puppy and meet some real canines, along with Rufus the Reading Dog from the Public Library of Cincinnati and Hamilton County. Los chicos les encanta leer, right? So visit the blue manatee on Saturday for Spanish Storytime at 10:30am. Kids will learn a few new Spanish words to add to their vocabulary! SYSTEMS GO, a music combo from the Air Force Band of Flight, will be at Sharon Woods Saturday from 7pm-pm, so if you miss them in Reading on Friday (see above) you have another chance! 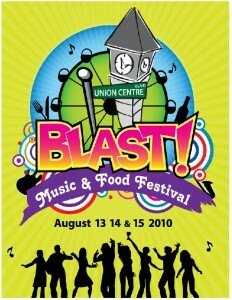 Union Centre Blvd Blast – all weekend in West Chester. Great music, yummy food, art shows, shopping, heck you can even catch a helicopter ride if you want! JENNIFER’S JAZZY JUMPIN’ SING-A-LONG at Duke Energy Children’s Museum (hello sweet AIR-CONDITIONING, right?) Dance and sing with professional singer/songwriter Jennifer Ellis on Saturday at 2:30pm – this event is free with admission to the Cincinnati Museum Center. Want to know the story behind the legend? Buddy the Musical – the rags to riches story of our very own Buddy LaRosa will be performed at Mt. St. Joe’s Friday and Saturday at 8pm – make sure you head out early so you can grab a slice or two before the show! Madisonville Cup & Festival – Saturday 9am-dark: The Madisonville Cup Race is a national points soap box derby. (I’d be lying if I told you I have any idea what that means, but it does sound exciting!) Come out to watch the race and stay for the festival fun afterward! So much to do…but let us know if we missed anything in the comments below – we’d love to hear from you! And whatever you and your family decide on this weekend, stay hydrated, apply and reapply sunscreen and be smart in this heat! Geez, what a LIST! Keep up the good work, ladies!